On one of our last nights on Vancouver Island, our family headed to the aptly named Log House. A classy upscale log cabin with dark wood tables, and dim lighting inside with a cozy and warm atmosphere. The semi-circular building offered almost every table a view from large windows, and our view was of a grassy meadow, reflecting the colors of the sun setting as the day drew to a close. Service was efficient and polite, with waitstaff knowledgeable about the menu items. But on to the foooood! The cleverly named appetizers are heavenly. 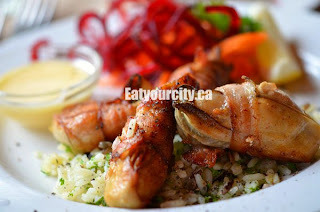 Large oysters are wrapped in double smoked Heller's bacon and grilled to perfection. 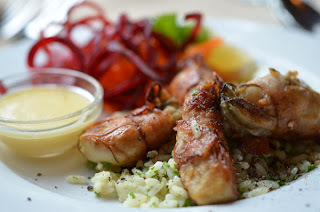 They were absolutely amazing, with the crisp saltiness of bacon adding to the juicy and savory rich fresh oysters. They were served with a in house made hollandiase-like sauce, but we found they stood better on its own, and ignored the sauce and seasoned rice it came with... and ordered a few more of these tasty bites, so there was enough to go around. NOM! We're out on the West coast, so of course we're not going to pass up on eating fresh chowder when the ocean's wealth of seafood is literally a stone's throw away. This clam chowder was tasty, rich and full of various bits of seafood. Surprisingly, despite the proximity to the ocean, they used canned clams. 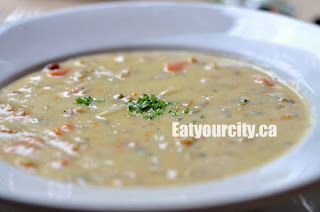 There was however, fresh large chunks of salmon throughout this thick, creamy and savory chowder. 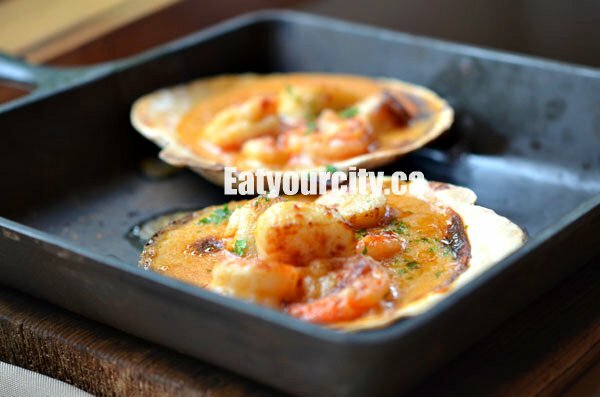 Scallops and shrimp were baked to a tender savory perfection, laced with lots of butter and garlic, before being smothered in a rich and creamy cheese sauce. They were served sizzling hot in the scallop shell inside a cast iron skillet. The cream sauce surprisingly didn't overwhelm the dish, but added a rich indulgent note to the fresh seafood swimming in garlic butter. 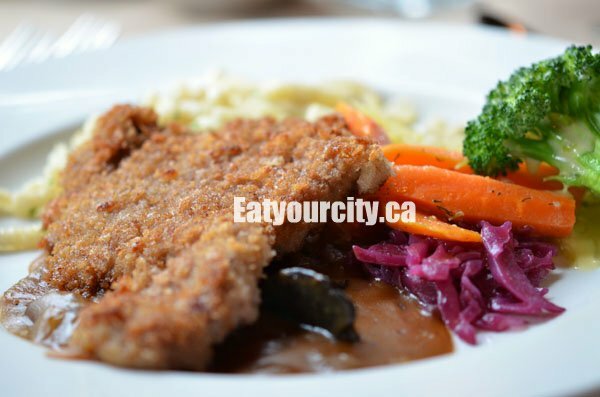 This aromatic dish was a huge pan fried breaded veal schnitzel in a generous puddle of rich and savory German style Hunter's sauce with mushrooms and onions. The schnitzel, though generous in size, was on the thick side and thus a bit chewy, unevenly battered, and cooked to a very well done. The Hunter's sauce had a taste profile of a savory beef gravy - an excellent sauce - rich and flavorful with sauteed mushrooms and caramelized onions that worked well with the soft-springy spatzel. We would have been perfectly happy with a bowl of the spatzel swimming in the gravy.. nom! The veges weren't an afterthought on this plate, as they were flavorful, with the beets pickled to a sweet tartness. The veal parmagiana was the special of the day, and it came with a side of spatzel. The veal we suspected was batched cooked from the veal schnitzel as it was also thick, overcooked and had a thick uneven bread crumb crust. 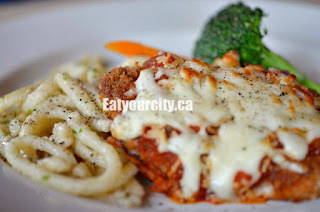 It was doused in a standard tomato sauce and topped with melted cheese. The spatzel stood out and easily eclipsed the dish as it was executed well. The spatzel was soft with a springy mouthfeel and seasoned with plenty of butter. When we snitched some Hunter gravy from another the Schnitzel dish... it was amazing. This sole entree was nicely executed. The sole was lighty breaded and pan seared to a moist silkiness contrasting nicely with its golden crisp crust. 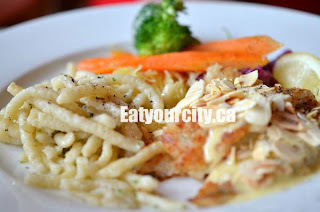 It was then topped with roasted slivered almonds and drizzled with a freshly prepared hollandaise sauce. It was paired with more of the tasty buttery seasoned spatzel and a few blanched veges. Overall, a picturesque place with a warm and cozy atmosphere to have dinner with friends or family. It was a shame the execution on the veal schnitzels fell short, but the Angels on Horseback are not to be missed, and deserve a revisit.